Marukura Family Sweet White Miso is a popular, smooth and delicious "Kyoto-Style" miso that is family-made in small batches giving it a delectable authentic flavor. 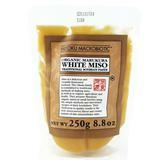 One of our more popular and best selling misos! Aged 3-4 Months.